When I started blogging a year ago, I wasn’t sure what to expect. During my first month I posted 36 recipes, eight of them for beetroot dishes – don’t ask me why, received four comments from strangers including one here from John@heneedsfood – I was starstruck for a week, and averaged eight hits a day. I wasn’t sure if this was good or bad, but I was excited and happy to be doing what I loved: cooking, eating and sharing. Eventhough some of my earlier photos were not entirely upto my current standards, especially when it came to photography – if I could help, entertain or inspire one person, it was a good start. Somehow, and somewhat surprisingly, it didn’t take long for my audience to grow beyond easily recognizable names of friends and family. Fast-forward to today, my daily average for August has improved over 100-fold. I know, numbers are not always what blogging is about, but it’s definitely a testament to one’s work. The single fact that you are out there reading my posts, trying my recipes and sharing the food that I created with your friends and family inspires me the most. It inspires me to keep going, to get more adventurous, to create recipes that are easily accessible to even the most novice of cooks. It inspired me to create my Restaurant Inspired section where I attempt to reverse engineer dishes I had tried at Sydney’s prime dining spots. Interestigly, the first dish in that category was from Etch (Becasse’s sister venture). It inspired me to recreate the best Homemade Peking duck I’ve had in my life. The next morning I woke up to an Inbox of 80+ emails containing comments, likes and new subscriber alerts. I had been freshly pressed!!! I was shocked, happy, humbled and proud at the same time. What an amazing experience, and one that has helped me connect and now keep in regular touch with so many of you. I can safely say that my decision to continue writing for Wholesome Cook has been one of the more rewarding experiences. I’ve made new friends and inspired non-cooks to cook. I’ve been inspired and humbled by others, their creativity and passion for food. I have discovered new flavours, cuisines and experimented in the kitchen beyond what I would have done if it wasn’t for Wholesome Cook. Thank you so much for your continued support and feedback. Thank you for coming back, for reading, commenting and keeping in touch. Thank you also to Mr Chipconnoisseur (and his lunchbox) for being my fairest although sometimes my harshest food critics, thank you too for your patience and for putting up with eating your dinner cold sometimes. It means a lot. I will continue working on recipes for the blog, no doubt about that. I am also planning to dedicate more time to wholesome product reviews, as well as showcasing a variety of cookbooks, magazines and products that focus on healthy habits or support communities in need. I am keen to continue working on my relationships with a handful of brands I wholeheartedly support, as well as learning about others that share similar values. There will be giveaways too. And more Restuarant Inspired, beginning with Rockpool Bar and Grill‘s minute steaks. This has been in the making for some time… *drum roll* I am holding my first cooking class on Saturday! The menu of classes is available here and a schedule will follow in the next couple of weeks. I am extremely nervous, but excited. I hope I don’t faint. I am also currently talking to a few different publications and companies about recipe development opportunities which I hope will come to fruition in the comining months. To help celebrate Wholesome Cook’s 1st birthday, I am giving away a 12 month subscription to the Australian Healthy Food Guide magazine! It’s a great resource for creating quick nutritious meals and keeping up with good food news and trends. The giveaway is open to anyone, including folks overseas, because I’d love to hear from you. Good luck! To enter: Leave a comment below telling me what you enjoy most about Wholesome Cook or what recipes / product features you’d like to see more of. Bonus entries: 1) Like the Australian Healthy Food Guide on Facebook or 2) Retweet this post. Entries close by midnight AEST 18 August. Winner will be announced on 20 August on this blog and contacted by email. Many happy returns, Wholesome Cook! Oh and Good Luck with the cooking class .. you will rock that too! Being American, I don’t think I qualify for the giveaway. But I wanted to say kudos and tell you what I enjoy about your site. I like getting peeks at Australian culture, but mainly I come for the recipes. Your photography and lay out are clean too. I enjoy the variety too. Thanks Greg and Katherine!!! And yes, you do qualify 🙂 Good luck! Hey Kelsey, thanks for commenting – I look forward to reading about your plans and adventures too! And just as you said, we would have probably never found out about each other if it wasn’t for social media… So here’s a cheers to that too! Yay! how exciting that you are running a cooking class 🙂 and i’d love to see more wholesome product reviews. Hi Wendy, agree with your point to feature a bunch more Asian recipes – they are known for their use of fresh ingredients, right up my alley! Congrats Martyna! You’ve done a beautiful job over the last year, and created a space that I (and many others of course) love to visit for inspiration and your “voice.” I have always appreciated your advocacy for fresh, healthful foods, and beyond that, your efforts in showing people that they can eat WELL (and be full and happy) without added preservatives/fats/salts that hurt us inside and out. I look forward to seeing what’s to come from you in the next 12 months. Plus… good luck with the classes! I’m sure they’ll be absolutely fantastic. Thanks Yasmeen, great to hear you’ve been enjoying my musings and recipes. Congrats, you’ve done an amazing job in just 1 year. I try to eat healthy food and love how the design and photography in your blog lift up dishes that sometimes are not that “photogenic”. All the best in your cooking classes! Thanks Gaby – now I’ve been following you and I’m thinking I need to get a few more workouts in. Perhaps try yoga… You too have inspired me! Congratulations Martyna. It was wonderful reading about your success. Looking forward to many more wonderful meals, photos and good reads. I just cleared my throat to begin belting out a Happy Blogversary number. Congrats! Congratulations on your blogversary….there are two things I love about your blog: your photos have great perspective, colour and styling which I think brings everything to life really well; secondly – your recipes are great! Thanks Marianna! Comments like these make me smile. 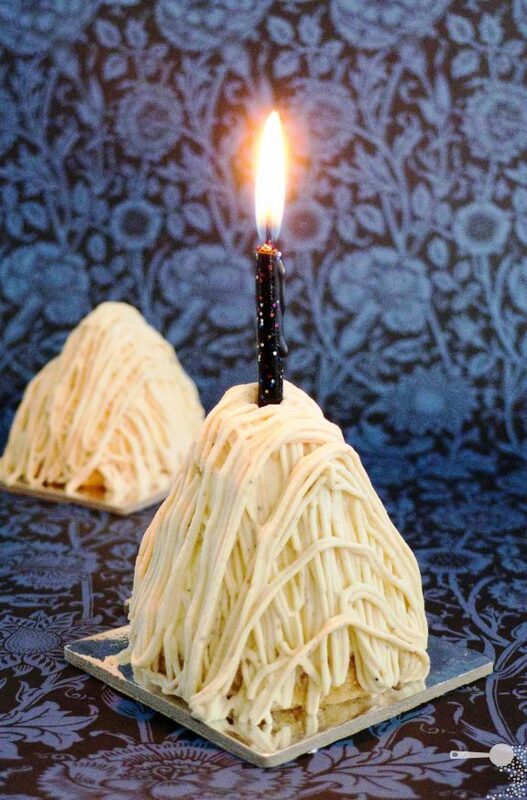 Wow, the Mont Blanc cake looks like the perfect way to celebrate your blog birthday! I’m one of the newbie/tragic cooks that you’ve inspired. I like that you put some really easy recipes up on your blog for non-cooks like me…your photos are always stunning too! Keep cooking & blogging! I did love the DDDUCK recipe!!! very well explained! I do have it printed next to my fridge, one day i will give it ago! Happy Birthday! I know how it feels when your baby reaches this first milestone as my blog turned 1 last month. Being in the Northern Hemisphere I celebrated with a summer pudding http://whatsforteatonightdear.wordpress.com/2011/07/10/one-year-older-any-the-wiser/. Anyway congratulations and keep up the good work! I like the wide range of vegetarian recipes that they have on their website! I like all of the 5 ingredient of less recipes that you have on your site. Happy bloggingversery! Isn’t blogging great? I’m a year old too these days and even though I’m not that much on top or anywhere,I made so many friends,advanced so much in my cooking. I’d love to see a tutorial on food photography and tips on how to the photos accepted (it’s getting frustrating now:))))though I can tell already what is each site looking for in a photo). I love this site because it comes from the heart not the pocket as there are so many other sites doing it for the money. Your recipes are great for the whole family easy instructions, beautiful pictures, yummy recipes so much better than a boring recipe book. Ive only been viewing your site for 6months but in this time i can see you grow your recipes are getting more daring and your pictures are stunning most cooks have someone taking there photos you are doing them on your own and they are ony getting better. I cant wait to see what you come up with next. Thankyou for making our family dinner table a pleasure each time when we use your recipes. Oh Natalie, thank you so much for your kind words! I’m so happy to hear you and your family have been enjoying the recipes 🙂 more to come, including allergy friendly additive free product reviews that have been requested… Thanks for coming back! I’m a new follower so I don’t know much about your blog, but I do see you have many vegetarian and allergy-friendly posts which is great!! I’m lactose-intolerant so vegan dishes are also something I keep an eye out for! Hi Erin, welcome – I always try to suggest dairy free substitutes where possible so that people like yourself can benefit from the simplicity of the recipes and goodness of the results. I just discovered your blog tonight and I love the simplicity of your recipes and they’re pretty healthy too! And you’re an Aussie – nice to see some more of us healthy living types where I can readily buy the ingredients! Oh hi Liz, thanks for stopping by and for your kind comment. I do agree it’s always easier to be able to understand the recipe and ingredients within it, and obtain them with ease at your local shops. I hope you’ll be back. I’m a new follower, and I love this so far! I’m very new to “grown-up” cooking, and your blog will be such a great tool! Thanks Emily, indeed my recipes are quite simple, even for novice cooks so I hope you’ll find something useful in the collection. Happy cooking! Hi Danielle, thanks for the comment. I agree that a nutritional breakdown would be useful, definitely something I can look at going forward. And yes, I need to post that chocolate fondant recipe… It’s been way too long! Happy Blogiversary to you! And Proost to many future blogging years! Your recipes look fabulously delicious! I’ll be sure to check out the cooking classes too! Oh, by the way, that Mont Blanc cake looks wonderful! Wish I could take a bite out of it right now. The thing I enjoy the most is how they take such mouth watering pictures of the dishes. I always like to visualize a dish before I create it, so that helps me a lot! Great site! Really like the variety of recipes and would love to read lots more reviews! !